Hung from the doorway with care. We own a small amount of decorations purchased from stores, but tonight we got a little crazy with homemade decorations. Thanks to an excellent video from my husband's cousin, a teacher in Limerick, Ireland, these paper snowflakes stole the show. 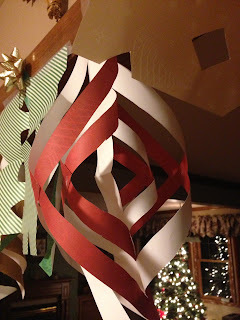 But it was exciting to watch my older boys grasp the concept of making their own versions of paper snowflakes and paper garland. They made mistakes, they tried new ideas, they complimented each other's work and helped each other out. I got in on the action, too, and tried some variations of my own. It was a beautiful Christmas moment, and I loved every minute of it. The green one is mine!